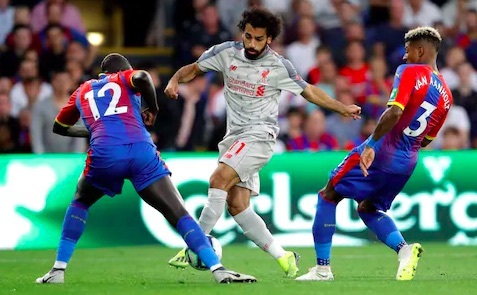 Crystal Palace defender Patrick van Aanholt is up for the challenge of keeping Mo Salah quiet on Saturday. Liverpool face the Eagles at Anfield in a 3pm kick-off, looking to extend our lead at the top of the Premier League table to seven points before Manchester City play on Sunday. And Roy Hodgson’s Dutch defender has promised to ‘shut down’ our no.11, despite admitting Salah’s brilliance. “Yeah, I always want to play against the best and Salah is one of the best in the league,” Van Aanholt told Sky Sports, cited in the Echo. As the defender states, Palace went to the Etihad and got the three points, so it’s not going to be an easy game. They were of course aided by a world-class goal from Andros Townsend; the best we’ve seen this season by some distance. But if Liverpool come out of the blocks quickly and get the first goal, it should be relatively routine, although we’ve often waited until the second-half to find the back of the net this season. We think Jurgen Klopp will stick with the 4-2-3-1 formation that has seen most of our good football this term, and considering injuries, could pick this side: Alisson; Milner, Robertson, van Dijk, Matip; Fabinho, Henderson; Shaqiri, Mane, Firmino, Salah. It should have more than enough to do the job.